As Bass noted in his Visible Knowledge Project work with faculty, what “most interested—or eluded—them about their students’ learning” involved the “’intermediate processes’” that occur before students write a paper or take an exam. They were particularly eager to “gather information not available from finished products such as papers or ephemeral evidence such as class discussion, which they could not study reflectively” (Bernstein & Bass, 2005, p. 39). These earlier stages in learning are often hidden, kept private in the students’ minds, leaving faculty to assume or guess what students think and know—or don’t. This capturing of the learning-in-process is the goal of formative assessments, or low-stakes activities used to identify learning, gaps, and confusion well before the higher-stakes, summative assignments of essays, exams, and the like. This guide from the CFT offers a variety of such assessments (commonly called “CATs,” classroom assessment techniques), but one is particularly effective at making visible these rich, elusive, telling moments: concept maps. 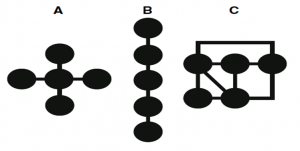 Concept maps are diagrams of how students connect ideas, particularly effective at “externalizing and making visible the cognitive events of learning” (Kandiko, Hay, & Weller, 2012, p. 73). 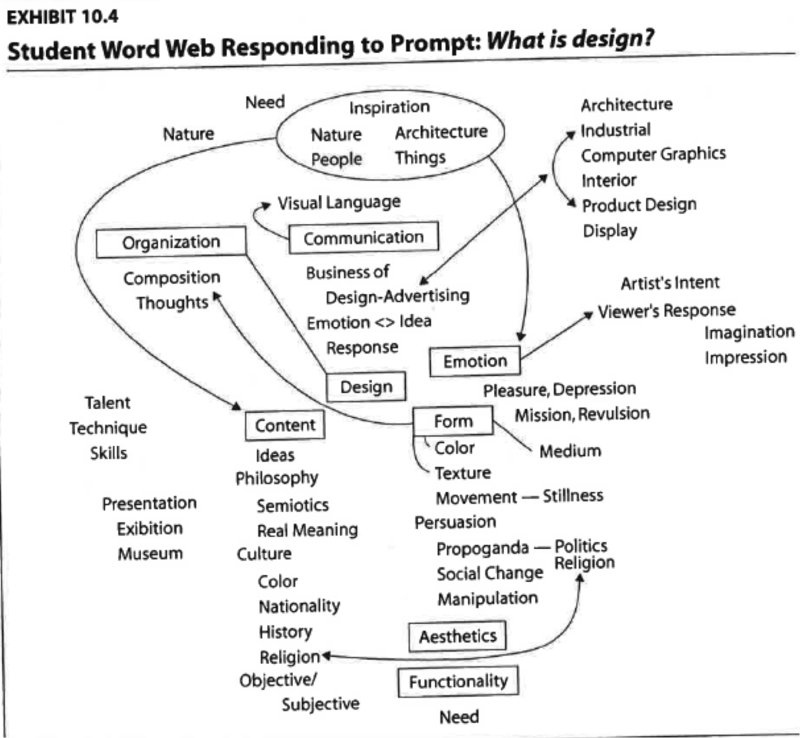 Word webs is an alternative term, most commonly used for concept maps made in collaborative groups (Barkley, Cross, & Major, 2005, p. 226-231). These “cognitive events” include making and defining connections, demonstrating hierarchies or chronologies, developing ideas through support and examples—and, when juxtaposing earlier and later concept maps, working out individualized frameworks of understanding, building an argument, forming more complex syntheses of ideas, and showing changes in thinking. Even further, comparing two or more maps or webs by the same student can make visible changes in thinking—additive or “assimilative” thinking in which students incrementally map new ideas onto old ones, or conceptual thinking in which students eventually revise and build their own their structures for understanding a concept. 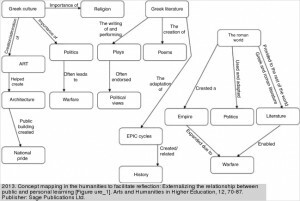 Kandiko, Hay, and Weller’s “Concept Mapping in the Humanities to Facilitate Reflection: Externalizing the Relationship between Public and Personal Learning” (2012) focuses on this latter, conceptual approach, which they note is closer to the ways of constructing knowledge in the humanities. Progressive maps or webs can document “continual processes of rehearsal, revision and reflection among theory, argument and debate,” or “recreating meaning and personal understanding” (p. 77-78). 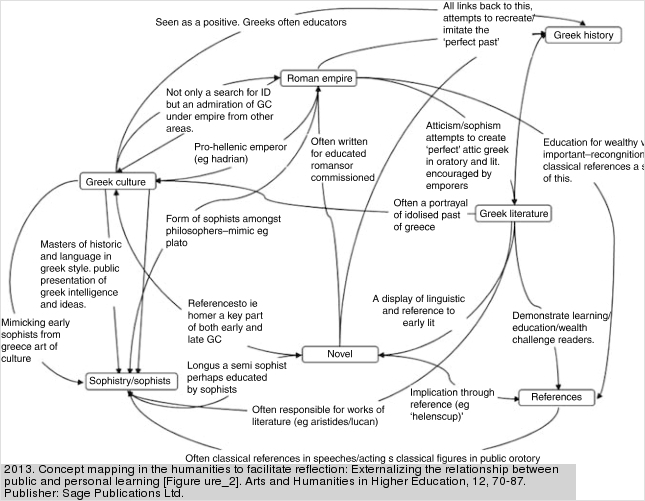 The authors illustrate with a case study from a Classics course in which students were simply asked to make three concept maps—in the beginning, middle, and end of the semester—of the overarching course topic, “’The impact of Greek literature and culture on the Roman world’” (p. 74). The first map (left) reveals the student’s early understanding with hierarchically, chronologically, and causatively organized ideas. This first attempt captures a “general, descriptive account of the subject matter, drawing on the presentation of public knowledge recalled from lectures and readings” (p. 76). This kind of map can effectively document basic comprehension of course materials. 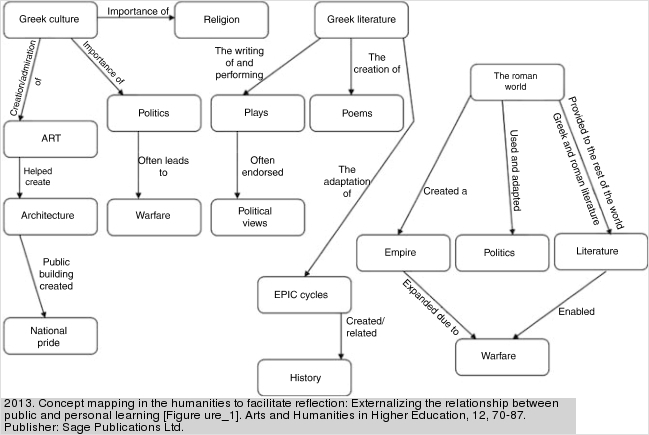 The student’s second map (left) illustrates the “development of personal understanding” of the course material (p. 76). The revision from the first to second map is the most dramatic, completely restructured in a more individualized way that reflects the student’s personal process of making meaning and experimenting with his own frameworks for understanding–in other words. the “intermediate processes” sought in the Visible Knowledge Project. Finally, the last map (left)—read “as a whole, instead of as a set of linked and cross-linked concepts”—illustrates the student’s “concentration and development of an argument” that is “personally reflective and grounded in narrative” (pp. 77, 79). 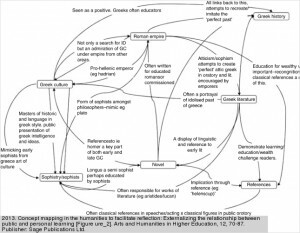 Beyond comprehension, this way of mapping documents the student’s efforts at practicing the ways of thinking of a Classicist. 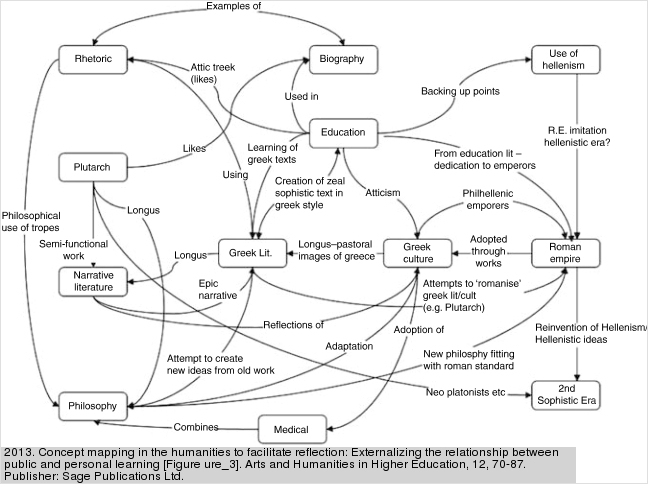 Unlike the original use of concept maps to assess comprehension and additive knowledge in biology classrooms, this approach uncovers the shift from a student’s public reproduction of others’ ideas and patterns to the process of creating the student’s own conceptual frameworks, arguments, and stories of the discipline. 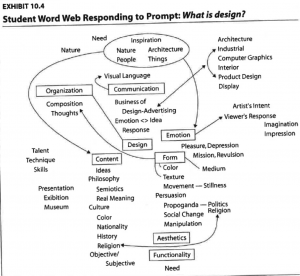 To the right is an example of a word web–similar to a concept map but with more emphasis on words and networks. The blog post “Concept Maps in Philosophy Courses” offers an example of mapping a philosophical argument. 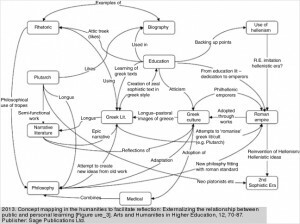 “Concept Mapping in the Humanities to Facilitate Reflection: Externalizing the Relationship between Public and Personal Learning” (2012) by Kandiko, Hay, and Weller is a solid analysis of how concept maps are useful in the humanities and the source of the examples above. The same activity can be used for the entire class to demonstrate changes in thinking over the course of the semester. 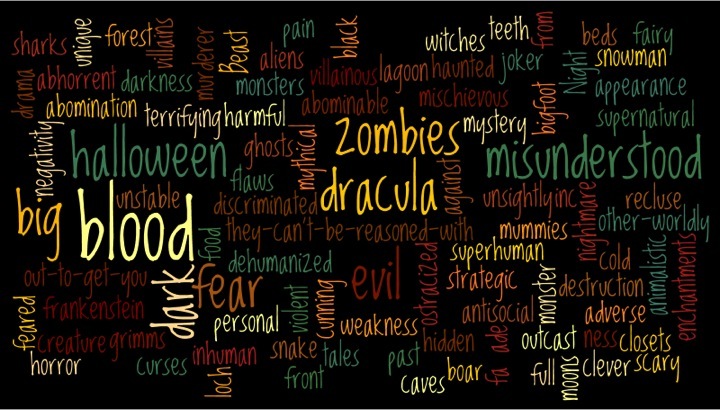 For instance, below are word clouds from a literary and film course on monsters from the first and last days of class is in response to the question, “What is a monster?” Students were then asked to analyze the two word clouds and articulate how the class’s understanding of monsters had changed during the course. 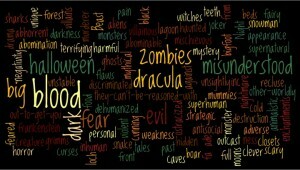 Create word clouds with the Wordle website or the Textal iPhone app. Barkley, Elizabeth F., Cross, K. Patricia, & Major, Clair Howell. (2005).Collaborative Learning Techniques: A Handbook for College Faculty. Jossey-Bass: San Francisco. Hay, David B., Wells, Harvey, & Kinchin, Ian M. (2008). Quantitative and qualitative measures of student learning at university level. Higher Education, 56. 221-239.